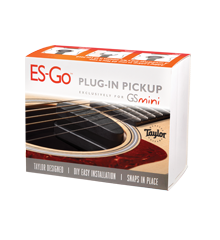 You've installed the ES Go pickup in your GS Mini and there's a "hum" noise when plugged in. What's going on? A constant hum coming from the ES Go pickup is usually a sign that there is a not a solid ground connection at the amplifier or audio device the guitar is plugged in to. If touching the metal end of the cable or the jack itself makes the noise get quieter or go away completely, you definitely have a grounding problem with your sound system or electrical outlet. 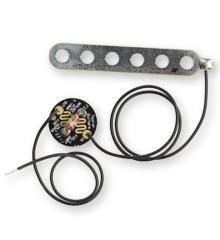 If you're unable to track down the electrical problem, the fused string ground can be installed to help reduce the unwanted noise in certain environments. When installed, your body becomes the path to ground. Touching the strings will quiet down the noise in the same way that touching the jack quiets the noise. Please note the fused string ground is not a fix for a faulty pickup design. It's a modification that's available for ungrounded and/or noisy environments.